Big Mama's Home Kitchen: Vanilla Birthday Cupcakes (Tastes like sugar cookies)! Vanilla Birthday Cupcakes (Tastes like sugar cookies)! After years and years of ordering cupcakes from bakeries around town every time a birthday rolled around, I finally decided to try making some homemade cupcakes for my daughter's 9th birthday. Seriously, how hard could it be?!? They were very simple to make and tasted scrumptious. They are moist and dense and remind me of a good sugar cookie. I got this recipe from Forty Cakes. Preheat oven to 350 degrees. Line standard muffin/cupcake tin with paper liners. Whisk together flour, sugar, baking powder, and salt in bowl. Add butter, sour cream, egg yolks, and vanilla. Beat at medium speed until smooth and satiny, about 30 seconds. Scrape down sides of bowl with rubber spatula and mix by hand until smooth and no flour pockets remain. At this point, the batter will be fairly thick. Divide batter evenly among cups of prepared tin using ice cream scoop . Bake until cupcake tops are pale gold and toothpick or skewer inserted into center comes out clean, about 20 to 24 minutes for regular sized cupcakes or about 15 minutes for the mini-cupcakes. Transfer to wire rack to cool cupcakes to room temperature. You can make the icing while patiently waiting on the cupcakes to cool. Don't they smell good? In a large mixing bowl, add butter and beat until creamy. Add powdered sugar and continue to beat until smooth. Add vanilla and slowly add the milk until the right consistency. It will need to be thicker if you are piping onto cupcakes. As you can see from my picture, my icing was not quite thick enough because I ran out of powdered sugar. It probably didn't help that it was a very HOT and humid day in Texas! No biggie...they still look cute and everybody loved them! 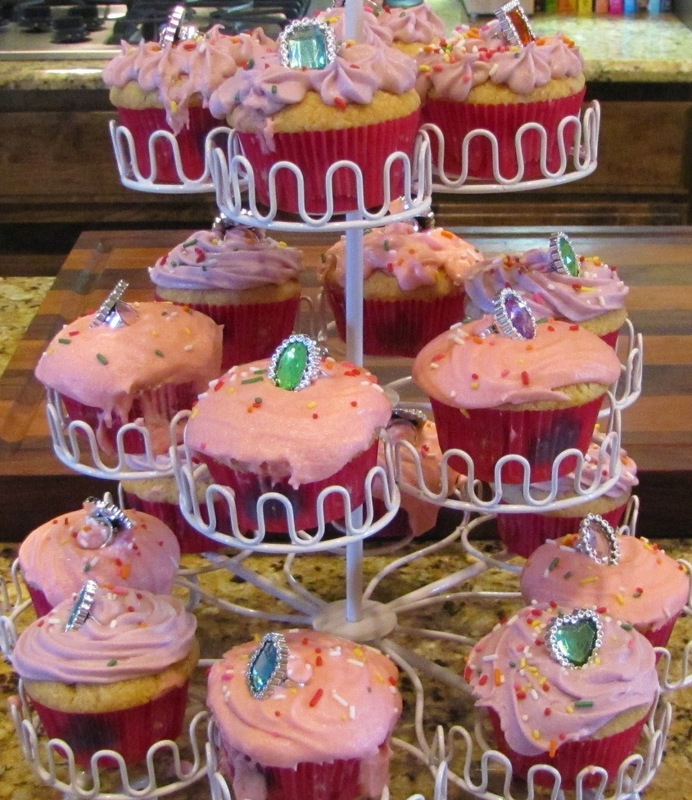 When the cupcakes have completely cooled, pipe or spread frosting and decorate for the occasion. My girls love helping with this part. Sprinkles are always on the kitchen floor all the way to the living room floor on cupcake days! Enjoy!